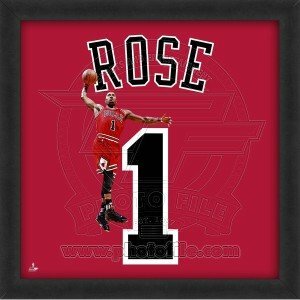 This Derrick Rose Uniframe Jersey Photo is a photographic representation of your favorite player's jersey. Display it in your home, office, family/sports, or kid's room. The framed 20"x20" photo (measures 22"x22" with frame) includes a dramatic silhouetted action image of the player and his jersey. The photograph is attractively framed under glass in stunning black wood and is ready to hang. Upon request, the item can be made without glass for autographs. If you have any questions about this product by Biggsports, contact us by completing and submitting the form below. If you are looking for a specif part number, please include it with your message.